Ask some old audiophile (like me) about Infinity, and he'll probably tell you about the Infinity Reference Series speaker, which broke the $40,000/pair price barrier way back in the 1980s. Or he might talk about the Servo Statik 1, which was the first subwoofer/satellite speaker system when it launched even further back, in the 1960s. So what's Infinity done since, you ask? Good question. Since 1983, the brand's been owned by Harman International, currently parent company of JBL, Mark Levinson, Revel, and bunch of professional audio brands. Harman's interest in the Infinity brand seems to wax and wane. We've seen the brand on a lot of very nice products, especially the high-efficiency Compositions Series of the mid-1990s and the rectangular-woofered Cascade Series of the mid-2000s. But there hasn't been a real "Infinity sound" or "Infinity philosophy" since the days when MTV played music videos. The new Reference Series speakers represent something of a rebirth of the Infinity line, a colossal step up from the low-priced Primus speakers that the company's been pushing lately. The philosophy seems to be to take some of the awesome engineering that Harman has put into its Revel speaker line and bring it out at much more affordable prices. Who could argue with that? The R263 I'm reviewing here has a driver complement similar to what's in the Revel Performa3 F206 speakers I own: two 6.5-inch woofers, a 5.25-inch midrange, and a 1-inch tweeter. The tweeter and midrange employ CMMDs, or ceramic/metal matrix diaphragms, which first found their way into Infinity speakers about 15 years ago. Combining the two materials stiffens the drivers' cones and domes, and also damps resonances. The waveguide in front of tweeter evolved from the one that's been used on other Harman speakers, including my F206s. Just as with my Revels, the goals are broad, consistent dispersion and a near-total lack of sonic coloration. But very much unlike my $3,500/pair Revels, the R263 lists for just $1,099/pair. With an angular black woodgrain cabinet replacing the curvaceous, glossy enclosure of the Revels, the R263 certainly doesn't look as nice as the Revels. Of course, most serious audio enthusiasts would happily sacrifice looks if it meant the cost of their speakers was two-thirds less and the sound quality wasn't sacrificed. The R263 sits at the top of the Reference Series, which also includes a smaller tower, the $899/pair R253; two bookshelf speakers; two center speakers; two subwoofers; and a surround speaker. 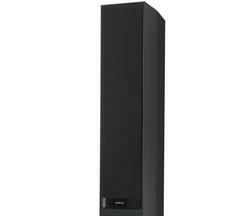 For home theater enthusiasts, a tower speaker is no good unless there's a great center speaker to match. So, in addition to the pair of R263s I borrowed, I also snagged the $499 C253 center speaker so that I could hear how well it matched the sound of the R263. There didn't seem to be anything unusual about the R263, so I moved my Revels away and put the R263s in the same places. The front baffles were about 36 inches from the wall behind them, and I put the speakers about eight feet apart, with my listening chair about 10 feet away from them. After connecting the pair of R263s to my Krell S-300i integrated amp, fed by a Cambridge DAC Magic XS digital-to-analog converter connected to a Toshiba laptop, I gave the system a listen so that I could fine-tune the speakers' positions. It's then that I noticed something really weird about the R263: the sound didn't substantially change as I adjusted the toe-in of the speakers. Whether I pointed them straight out or angled them in to point straight at me, there was practically no difference in the sound. That should be a good thing because it makes the speaker less sensitive to placement and, typically, less sensitive to the acoustics of the room it's in. I ended up splitting the difference between straight out and full toe-in. I later disconnected the Krell and set up the C253 center speaker, using my Revels as surrounds because I figured they'd be reasonably close to the sound of the Infinity speakers. For this setup, I used my Outlaw Model 975 surround sound processor, my AudioControl Savoy seven-channel amplifier, and my Panasonic DMP-BDT350 Blu-ray player. Click on over to Page 2 for the Brent's Full Measurements of the R263, plus the Performance, the Downside, Comparison and Competition, and Conclusion . . .